Hey folks, just want to do a quick review here on this set of mask I bought a few weeks ago. So I'm a fan of Lovemore's "New Zealand Kiwi Acne All Out" mask and my neighborhood Watsons stopped stocking them so I went to Sasa to see what else was offered, and saw this product that claimed to do a similar job. 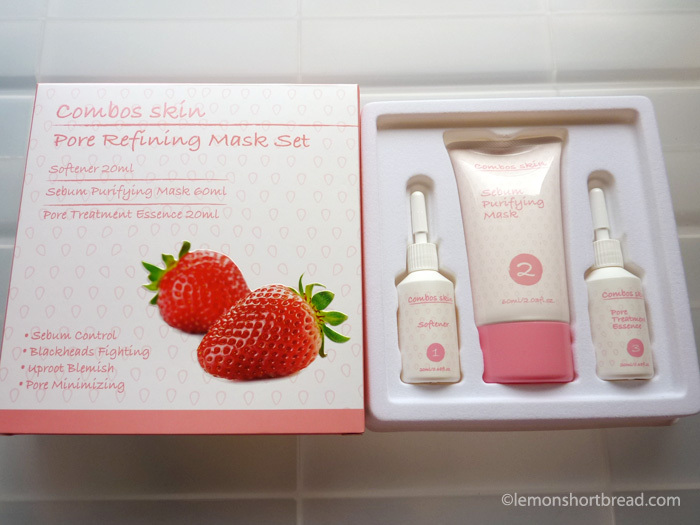 Sasa's Color Combo series: Combos Skin Pore Refining Mask Set. This post is a comparison with Lovemore's product, for Lovemore reviews just google and you will find many reviews by cute girls. This is not a paid endorsement. They are almost identical, with the main difference being the strawberry scent. The sebum softener smells very good. I love strawberry scents lol. I wanted it on my face longer so spent more time rubbing it into my skin which probably makes it so much more effective. Just squirt a bit on areas you want to apply the mask on to. The 2-3 drops instruction is a lie I tell you.... just squirt however much you need, and it will dry from massaging so I add a few drops of water on the face as I go along. The bottle design of the mask is slightly different with a smaller opening. 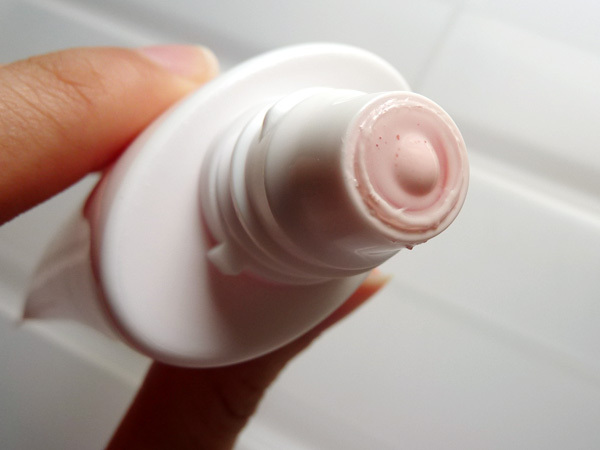 The Lovemore one has no additional cap so the liquid usually glops out. This one has a better control on the amount you need. The consistency is slightly thinner than the kiwi version so I needed a thicker layer to cover the pores. It smells alright. It does smell slightly of chemicals masked over with a strawberry scent but I can live with it. After rinsing the softener off, leave your face slightly wet and apply the mask on areas of blackheads/whiteheads/rough spots. I usually avoid applying on pimples. Apply a good layer till the skin cannot be seen... not too thin a layer (unable to adequately cover the pores) nor too thick (takes too long to dry). It dries pretty evenly and feels like I got the mask dried tightly too so the gunk will affix to the mask. 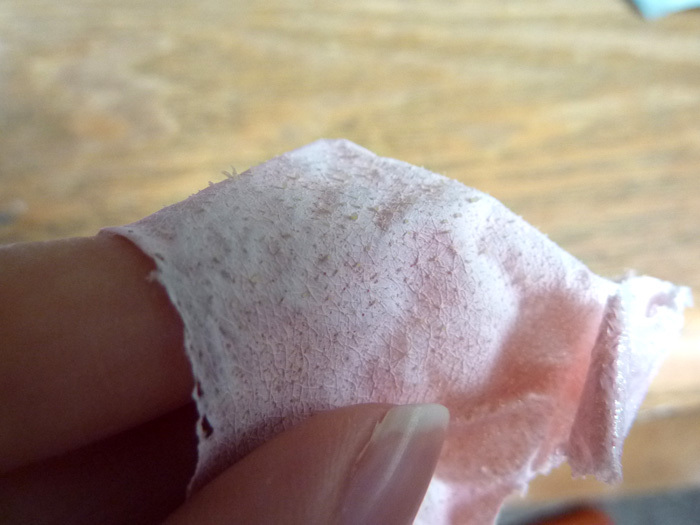 This is the disgusting whiteheads/blackheads/microhairs after peeling the mask off! I would say a good percentage of gunk is out.. 85-90 percent! And I've been having acne breakouts and using this sulphur cream that makes the plugs rise to the surface making my skin really rough so this mask just makes my skin soft again... by extracting it all out ahaha. 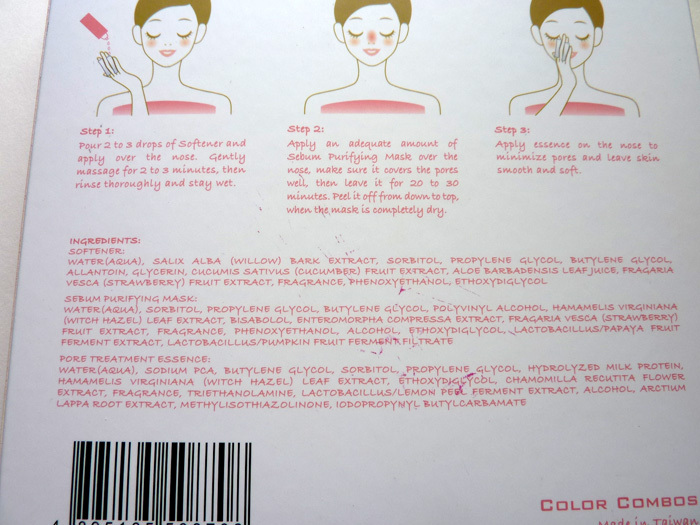 The last bottle is the essence to minimise open pores. It has a thicker consistency compared to Lovemore's, pretty much like what one would describe as 'serum'. Actually it became sticky as I pat it in but it absorbs quickly. Well that's it. I recommend it. I think it was cheaper by a bit since it is an in-house brand. Both are made in Taiwan and pretty much the same thing. If you don't mind a pink alternative to Lovemore's mask then use this. hi! i just bought the set too and am extremely confused as to how to open the bottles for steps 1 and 2. am i supposed to cut off the tip or something to squirt the product out? would really appreciate it if you could take some time to advise! @kaoru Just cut a little bit of the tips off!